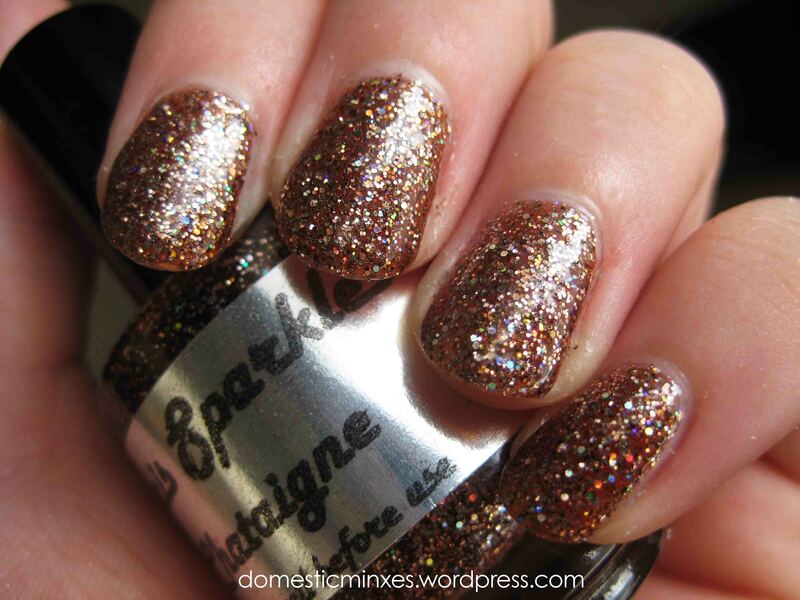 So a few weeks ago Paris Sparkles posted an amazing offer on their Facebook – 50% off! I jumped at the chance and picked up four beauties for my small-but-growing indie collection. Lookit all that pretty! Ready for some photos? Phwoar what a beauty! I can’t even begin to explain how in love I am with Chataigne. If you don’t already know, I’m a sucker for nudes, browns and neutrals, but I’m also addicted to glitter. This baby is right up my alley! It was much more opaque than I had been expecting, and truth be told I could have gotten away with two coats but I’m insane and added a third. Formula is a little thick, but it’s the good kind of thick – more coverage and great glitter pay-off, and it doesn’t flood anything. 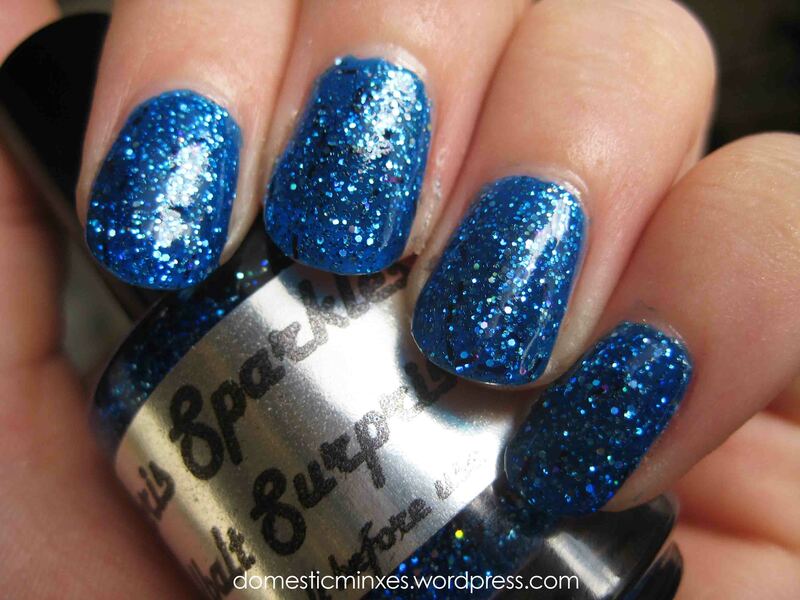 Dry time is good and removal is easier than other glitters I have. 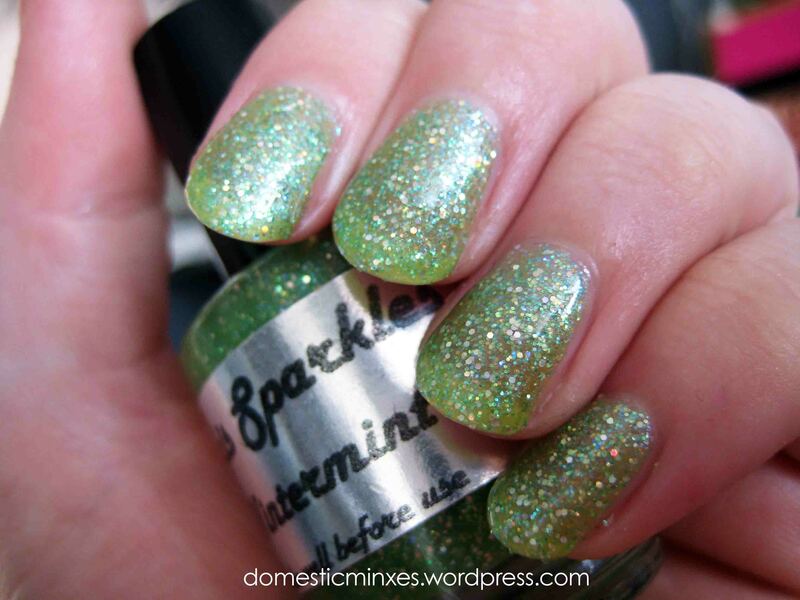 This is also one of the only polishes I’ve worn to work that managed to come home unscathed – an extraordinary achievement! Another absolute stunner! 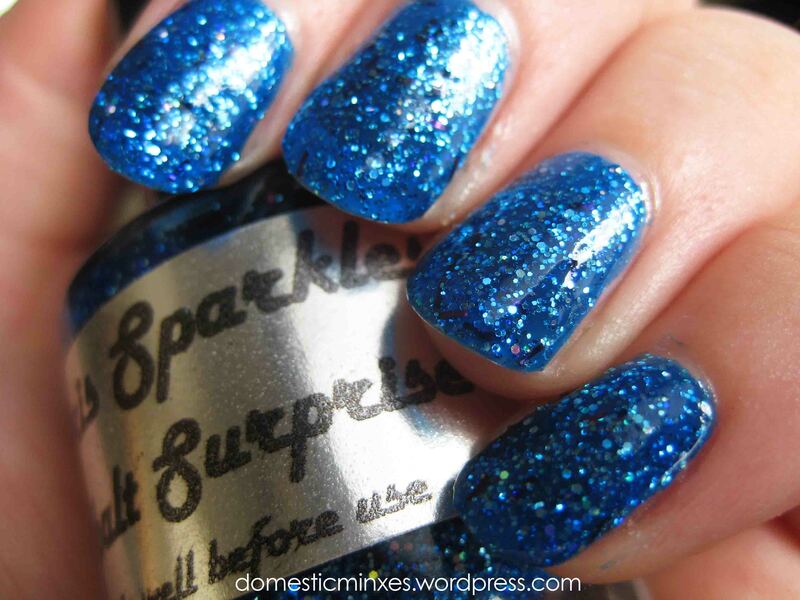 Somewhat reminiscent of China Glaze’s Dorothy Who?, Cobalt Surprise is different in that the glitter is bigger and has some holo in there, as well as some sneaky tiny purple bar glitter (which I guess is the surprise!). I’ll eventually do a comparison between the two, but for now believe me when I say Cobalt Surprise is more intense and a lot more fun! Same comments for formula as Chataigne – a little thick in a good way, great pigmentation and glitter pay-off, good dry time and decent removal. One happy minx over here! I love how potentially versatile Wintermint is; I already know that it looks great over green and I’m highly anticipating its usefulness over other shades too! I love polishes that I can experiment with! 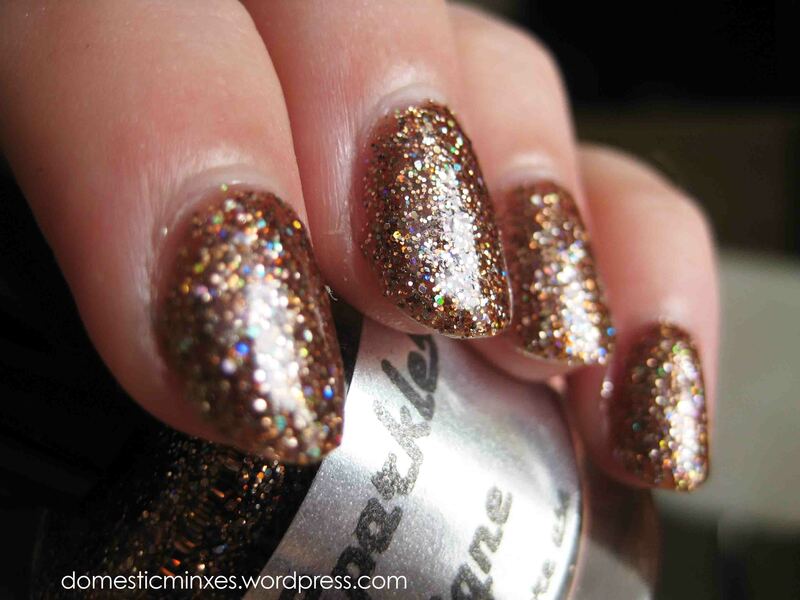 I also think it looks just lovely by itself if you’re after a soft subtle bit of colour and sparkle. So, win-win all round! 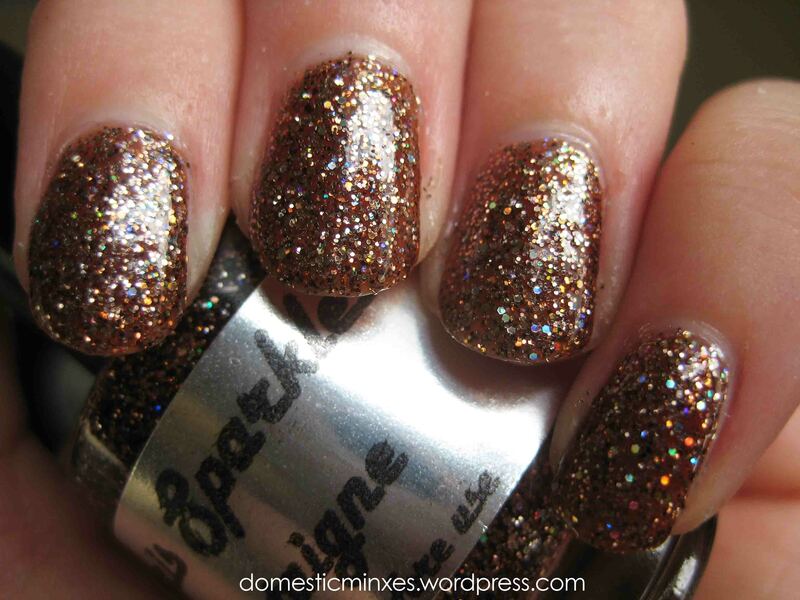 This was another polish with the easiest application and formula, I just have no bad words at all for Paris Sparkles. 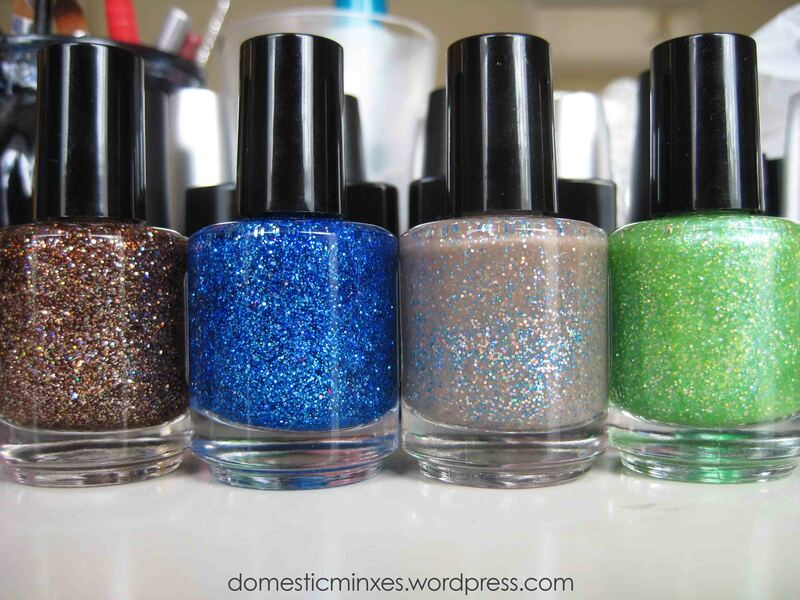 Great coverage for glitter polishes, I was especially surprised at how well pigmented the jelly-based polishes were. Full -sized bottles of 15mL (bow chika wow). Price was pretty decent too – only $8USD a bottle! Good drying time and pretty easy removal for glitter – I didn’t even need the foil method. Nada. I’m in love and may consider stalking. So what do you all think? Keen to pick up some pretties? If you follow Paris Sparkles on Facebook, you’ll see that there are many pop-up sales and discount codes, so keep an eye out for an opportunity to snap some up! 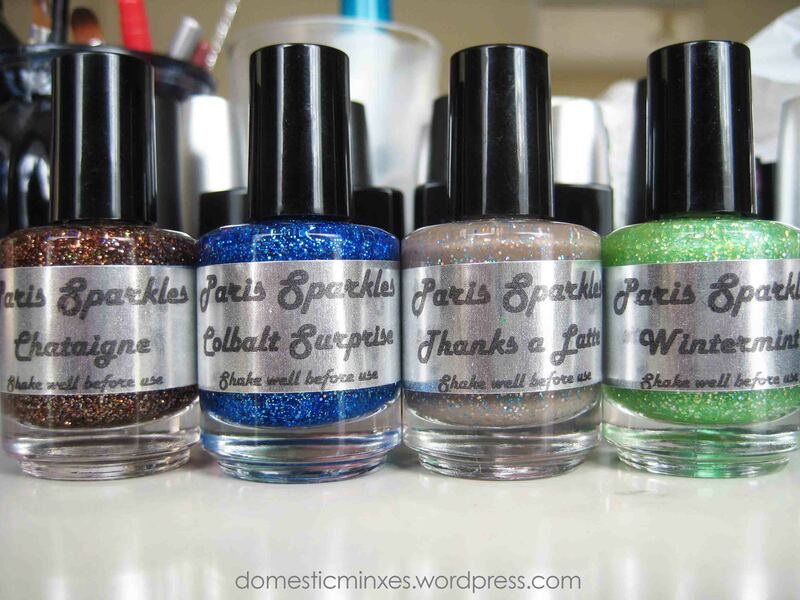 Paris Sparkles polishes are available online through their Etsy store for $8 USD apiece. I CANNOT say which I like more!!! They remind me a lot of the Liquid Sands by OPI in the way they look especially the cobalt! But STUNNING! Even the brown ones!